Lush green floras are captivating and soothing. The beauty of nature is unparalleled, and nothing can be compared to its serenity. The well-known slot game developer, NextGen, recently launched a slot set amidst the mystic woodlands. The slot, Great Wild Elk, has unmatched tranquillity to it. The slot has 5 reels and 10 paylines. The betting amount ranges from 10p to £20 a spin. The most attractive feature of the slot is the serene gameplay. As the player progresses through the slot, he/she experiences unmatched calmness and peace. The slot is beautifully designed with realistic looking woodlands, with eye-catching northern lights in the clear blue sky. 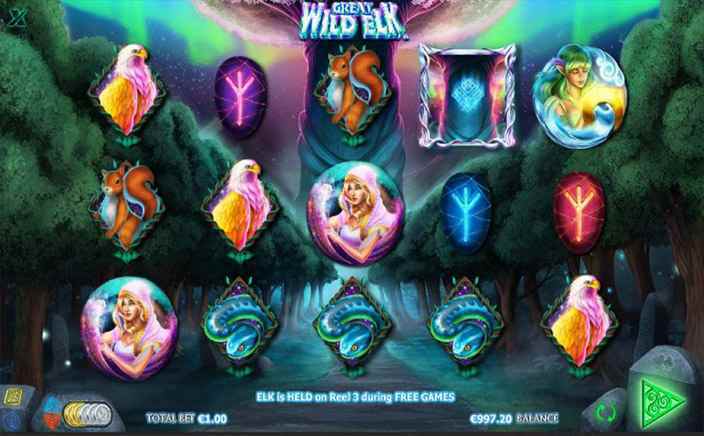 Great Wild Elk is a breath-taking slots game, laced with beautiful squirrels, magical elves and spirits, snakes and eagles. Experience an unparalleled aura with this slot game! The slot has three bonus features to offer. The elf is the symbol with the highest value. It offers 250 times the initial bet, on obtaining five symbols on the paylines. The scatter symbol offers 500 times the initial bet. The wild symbol in the slot is the Elk symbol. It acts as any other wild symbol. Elk’s light feature is one of the three features of the slot. It is randomly triggered in the base round. This feature reveals squirrel, eagle, snake, spirit or elf. These symbols replace the lower value symbols viz red, purple, blue or green rune, thus increasing the prize money. 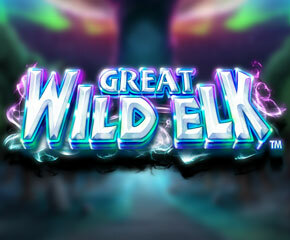 The other feature of Great Wild Elk slots is named enduring win free spin. This feature is triggered when the wild symbol appears in more than one win continuously. It provides four to ten free spin. During this feature, the wild symbol appears on the middle reel only. Also, whenever a tree symbol appears on the reels, the player is rewarded with the amount equivalent to current enduring value. Current enduring value is the amount won on triggering the feature. Also, amount won by the wild symbol is added to the enduring amount. The last feature is named call of the elk. In this feature, only scatter symbols and enduring win feature is won. The player is rewarded with a free spin every time he wins. This continues till no winning spin is obtained. The slot can be kept in medium to high variance range. Great Wild Elk slots is undoubtedly a pleasing and beautiful looking slot. But it can be a bit tedious and frustrating at times, as the stakes, generally, rise by just 30 times. Play the slot for its pleasing graphics and soothing aura!